Hope is a strange commodity. When we don't need it, we rarely think about it. But when we need it, we need as much as we can get. So it is for people who are dealing with cancer. 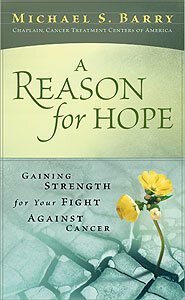 As a chaplain for the Cancer Treatment Centers of America, author and pastor Michael S. Barry has an insider's understanding of the cancer patient's need for A Reason for Hope. With warmth and wisdom, he offers the reader scientific evidence and Scriptural principles that fuel the will to live and build the hope that can heal. If you have cancer—or are in a support role to someone who does—here is A Reason for Hope.